Something worse than the Swansea loss. This is not a rant, just the result of a series of calculated thoughts! I was sat in my living room as early as 3:00 p.m (believe me that’s early in my books), waiting for the game, waiting for my darling Arsenal to put little Swansea to the sword. They didn’t disappoint at first, RVP got a well-taken goal as early as the 5th minute, and my mind was set on a big win, the type we had at Wigan. For God knows how, Swansea found a way back into the game, and won a penalty (maybe it wasn’t a penalty), to draw level. Terrible defending from Arsenal then gave them the lead. We leveled matters through Theo Walcott and amazingly, we gifted them another goal even before I was done “processing” our equalizer. We couldn’t fashion a way back into the game and we were beaten, fairly. A few individual performances spring to mind. Miquel shouldn’t have been playing that game had we brought in a left back. Ramsey was not up for it and Mert4 made a bad decision for the winner. Bar a well-taken goal, Walcott didn’t do a thing right, Szczesny is beginning to falter and we missed Arteta really badly. Now to what really bothers me; there I was a few minutes after the game, feeling normal. I mean we just lost to Swansea after the game and I shouldn’t feel normal, I should be livid! But for some reason, I wasn’t! I logged into my twitter feed and I was greeted with varying reactions to the loss. While some were venting their anger, others were searching for positives in what was an abysmal performance. We have the worst away record for goals conceded and it is as though we need to score two goals to draw games away from home! We were beaten at our passing game, and that’s quite worrying. Swansea seemed to want it more and that’s pretty disturbing. I think I was somewhere in the middle of those two groups; and with time I concluded that the reason I felt that way is because I was gradually becoming used to Arsenal screwing up things. You may have heard this before but I just wish to reiterate that Arsenal finishing in the top 4 this season will be Wenger’s best achievement to date. That in itself in enough to bring tears to anyone’s eyes. We cannot maintain the pressure that accompanies a run of good form without messing it up. Look at this, we had a very poor start, recovered well, but the moment people started taking us seriously, we began to falter. Injuries? Look at Man United and get back to me. I think it’s something to do with the mindset of the players, they are just not up for it, even Cesc said it! They don’t see themselves as a team capable of winning things, and if anything that’s the major positive I see from Henry’s return to the club. Arsenal players are like that kid in high school, who knows the pass mark is 40%, but he needs to study hard for 85% to get an A+. How well do you think he’ll perform? My guess is he’ll party hard and target 50% which in all fairness is a pass grade, and move onto the next one. For all the talk about contending for the title, I just think they do not believe it. They just look to be in the top four every year, get into the Champions League and “do well” in the cup competitions. Yesterday’s loss is just another on a long list of unbelievably poor results, and what’s worse is that us fans are settling for it. Slowly, the same Arsenal fans that celebrated titles a few seasons ago are the same ones “celebrating” a Champions League qualification. Yes, that’s how bad we have become. The club posts profits year in year out and neglects what really matters, the football. If you told me (with concrete evidence) Arsenal have no money to spend, maybe I wouldn’t have written this post. But apparently there’s some money to spend, we just don’t think it’s ‘necessary’. “I think it will be stupid to drop points simply because we don’t have full-backs.” – Wenger, two weeks ago. The talk of sacking Wenger now doesn’t even begin to arise. He gave a reasonable argument for why he’d rather wait for the injured players to return than bring in new faces. Whether or not this loss will change Arsene’s stance on winter transfers will be revealed in the coming days. That’s all I can take for today. Apologies for an unusually long post, I only felt the need to share everything I was thinking with you. Feel free to share your thoughts and comments below. Keep the faith wherever this post meets you! These were the words (well part of) of AW after we lost. He’s quite right especially as it was a £30M squad against a squad totalling over £190M & especially as we bossed the game for the entirety but it just goes to show that there is no quality(or even decent) back up for RVP as his two deputies on show yesterday were not up to it. Mixing experience and youth, AW sent out a line up of Fabianksi-Djourou-Squillaci-Koscielny-Miquel-Benayoun-Coquelin-AOC-Park-Chamakh and as always we set the tone of the game. Chances were far & few between in the opening minutes with the most notable thing the booing and taunts directed at Cashmir Na$ri and to the delight of the crowd, he got Frimponged, he was so poor he called off to the bench to be taken off but was ignored. The midfield trio of Coquelin-Frimpong-AOC were brilliant and made their cases for the first team with a display well above their ages considering the opposition. AOC sent over a cross for Park who taught he had scored but a brilliant save from the City GK prevented a goal. All this while, Chamakh’s only contribution was in winning aerial duels. AOC was to later force another smart save with a rasping drive from outside the box. Arsenal well on top and City feeding off scraps. As the tandem of Coquelin-Frimpong continued to work hard and boss the midfield that had Nasri-De Jong-Barry repeatedly, not to forget Miquel who pocketed Johnson throughout the game, the Ox was having a fantastic time outwide that Mancini had to ruthlessly substitute Kolarov at the 32minute mark. The half ended goalless. Second half started as the first ended with us truly on top but lacking creativity in the final third. Coquelin and Frimpong(notice I keep mentioning them) continued to delight the crowd with their energy, work rate & passing while Kolo Toure at the end continued to frustrate Park & Chamakh. It wasn’t long as AW took off the Korean for Gervinho and the Ivorian went straight into action, twisting and turning and dealing with Onuaha but Kolo Toure was having none of it. At our end, Kozzer too was having his own fun, dealing with the threat of Dzeko and Aguero easily(has to say he’s currently in the top 5 defenders in the league this season). Like they say if you don’t take your chances, your opponent might just kill you off if they have one and so they did. We won a corner of Toure, AOC took it but naivety killed the team as everyone went up and left only Djourou, the ball broke, Dzeko chased after it and released a long pass for Johnson, Frimpong chased after but no one tracked the run of Aguero who got the ball from Johnson and finished into the bottom corner. Undeserved. Against the run of play. It was to end like that. 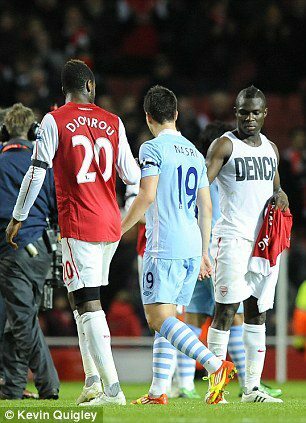 * Frimpong & Coquelin are more than alright, the loan spell for Francis has done his world a lot of good and even though there are talks for Frimmers to go on loan, he bellied his age with the performance he gave by pocketing Nasri & bossing De Jong. *Koscielny is world class. If you disagree then you’re just plain stupid. 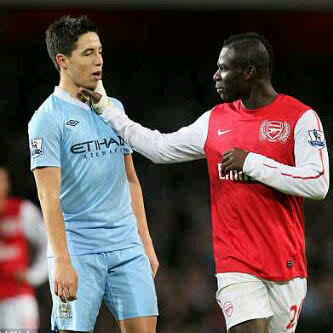 Against Dzeko and Aguero he had an excellent game and intercepted passes, won tackles and broke down attacks. 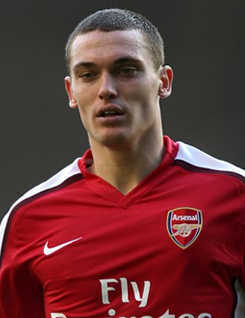 Surely must become Vermaelen’s partner. *AOC is more than just a kid. He’s a man. He’s been slowly integrated into the first team which must change. Look at Phil Jones of Man Utd for example. The way AOC played yesterday was a breath of fresh air and surely has to be ahead of Arshavin now. In conclusion, the game yesterday goes to show how the lack of quality strikers can lose/win you a game. City were poor but had Aguero & Dzeko on the pitch when they scored(both involved in the goal), we had Chamakh. That says it all, hopefully Wenger is convinced enough now not to ever play Chamakh & sell him off in January. Reus & Podolski should be bought, no more bargain buys, with £55M to spare, surely we can get quality. From wherever you are, have a great day and try not to think about it too much. Wenger Says Yes To Gotze. Song Steals The Show as god RVP Shoots Down BVB. Group winners with one game to spare, who would have thought that was possible seeing as we were ‘in crisis’ at the beginning of the season and the stalemate against Marseille threatened another episode of last season’s drama where we had to qualify as runners up on the last day. No such thing this time as Robin Van Persie as always came to the rescue infront of the Emirates faithful which had gunners legend Henry & tennis legend Roger Federer amongst them, but despite bagging both goals, Alex Song was the obvious man of the match. Arsene named the same squad for the first time in almost a year but had Diaby back in the team(on the bench) as the only plus. The game itself was a lull at the beginning and the earliest chances fell to the away team but they were tame chances which Chezzer dealt with very well. At the other end, Weidenfeller had to be alert to claim a wicked cross from Walcott which was aimed at RVP. Wunderkid & reported Arsenal target was having an off game as he carried an injury along but a collision with Vermaelen from Lars Bender saw the latter go off with a broken jaw. He got Verminated if you ask me. Gotze was to follow suit almost immediately as he couldn’t continue. All this in the first half alone. You’d think we would have it easy but Dortmund continued to frustrate and it ended level going into the break. It started way better than the first ended and Gervinho continued to cause chaos with his speed and dribbling but no end product. The first goal came and my dear was it a joy to watch, receiving a pass from Ramsey, Alex Song took the ball to the by line, cut in between two markers, faced with three more, with a fast feet move, bamboozled them before sending a cross for RVP who nodded home gladly. For a second the whole stadium wondered if ‘Black Messi’ was the one who just pulled off that magnificent move. Gervinho was next to follow, sent through on goal with just the goalkeeper by Ramsey, he fluffed his lines and Hummels got back in time to clear the danger. For all his hardwork and ease at going past players, Gervinho finishes worse than a girl. The strikers in the Arsenal ladies team finish better. The second goal which was inevitable, came through the unlikeliest of routines. Arteta fashioned a near-post corner for TV5 to flick into RVP’s path. Robin was never going to miss from there. 2 nil and we were cruising! We were 2 goals ahead and definitely through to the next stage. An almost perfect night, which would have been perfect had Song and Djourou not contrived to gift the visitors a goal. Song tried to waste time on the ball, but he should have been doing that at the opposite end of the pitch, not so close to his goalkeeper. The ball was stolen from him as he tried to pass to Djourou, a cross was sent into the area and somehow we conceded. Vermaelen’s reaction to the goal tells a story! Notwithstanding, we got 3 points, top the group and get to avoid the likes of Real Madrid and Barcelona. Our last group game away to Olympiakos is a mere formality now and it gives us an opportunity to rotate. Considering how we got into the group stages in the first place, this feels too good to be true! It remains to be seen if he does not end up on the list of “players we almost signed”. That’s all from me today, we have weathered the storm and are finally on our way back. There is still a lot of room for improvement though. If you take into account that Man United, Chelsea and City still have to play the last game to ensure qualification, it’s really not a bad time to be a gooner. We play Fulham on Saturday, it wouldn’t be selfish to ask for more of the same, would it? And this means 3 points, good football and more goals for the Dutch master! Have a wonderful day wherever this post meets you! Do leave us with your thoughts and comments!